After reaching their $100,000 donation goal, Terp Thon organizers continued to seek donations with less than an hour left in the event. Jazmin Conner/Mitzpeh. Day of Miracles, Terp Thon’s largest fundraising event of the year, raised $130,472 in 24 hours for children and families at Children’s National Hospital. Their event, which was held from noon on Nov. 15 to noon on Nov. 16 in the Student Organization Resource Center (SORC), exceeded their donation goal of $100,000. 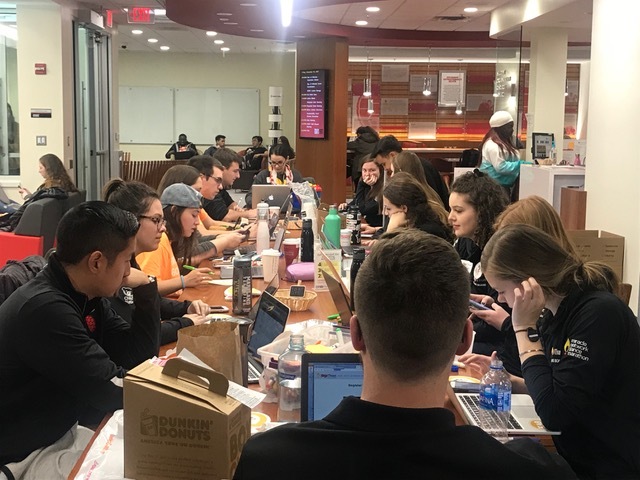 “This year we wanted to make it a lot more inviting and interactive so that everyone would want to stop in even if you’re not involved in Terp Thon,” said Analeigh Hughes, a junior journalism major and the public relations chair for Terp Thon. She explained that the biggest change to this year’s Day of Miracles was the added activities in SORC. The Genius Bar was one activity where students could receive tips on fundraising or help with troubleshooting problems. Other activities that stretched throughout the 24-hour event included a photobooth, lava lamp creation, slime-making, color sheets, board games and a merchandise sale where every $5 purchase added $5 to a student’s fundraising total. Another hour-long event gave students free ice cream if they showed proof of fundraising advertisement, such as an email to a person who would potentially donate. The most popular of the activities was the giant gong in the back of SORC. Students banged the gong every time they received a donation. “That was definitely one of the highlights of the day. It always is, because as soon as someone hits the gong everybody starts cheering for them,” said Hughes. Nadya Chehab, a senior environmental science and English literature major, said that the most memorable part of the event for her was the Imagination Room, where students were informed about how their donation money was spent in help of children and families. Last year, the event raised a little over $125,000. Hughes said she never doubted they would reach their goal again this year. Beyond fundraising, the organizers of Day of Miracles hoped the event would spark increased year-round involvement in the Terp Thon organization. “I definitely think people are aware of us. I just don’t think that people always know the specifics of what we do and why we do it,” said Hughes. Alissa Li, a senior accounting major, just happened to be in SORC while the event was happening. She had heard about Terp Thon through her service fraternity but was never able to attend any of the events. “[Day of Miracles] seemed like a lot of fun,” she said. “The E-board members seemed really into it so I think that just pumped up the energy.” Li said that after seeing Day of Miracles she would potentially become involved in other Terp Thon events for the service aspect. Beyond Day of Miracles, Terp Thon is known for their Life In Color 5K held in September on Mckeldin Mall. Students race, run and walk five kilometers while experiencing a color throw, listening to music, eating food and participating in other activities. The organization’s most popular event is Terp Thon on Mar. 9 where students join a 12-hour dance marathon to represent the length of a nurse’s shift at Children’s National Health System in Washington D.C. Throughout the day, dancers also get to hear personal stories of Miracle Kids and see them perform their talents. Student groups also perform, and everyone learns a special dance. “I think [Day of Miracles] just showed our campus what we are capable of when we come together. And hopefully going off that momentum people will want to stay involved, get their friends involved,” said Hughes. No Replies to "Terp Thon’s Day of Miracles exceeds $100,000 donation goal"